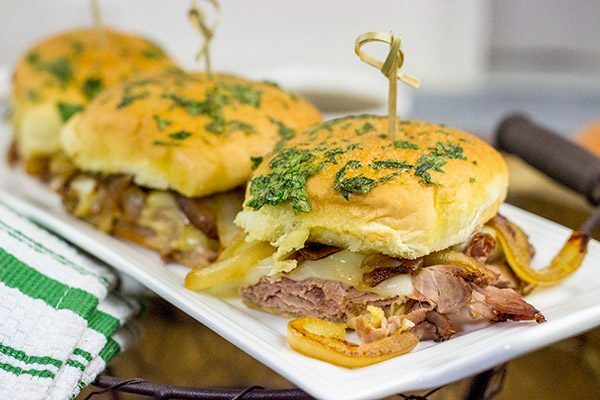 French Dip Sliders - A delicious shortcut version of the classic beef slider! 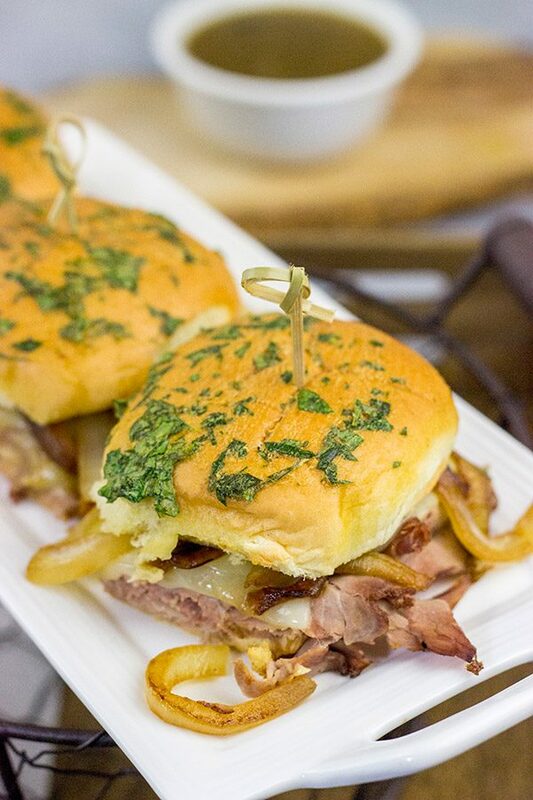 These French Dip Sliders use deli-sliced roast beef for a shortcut version of the classic. The caramelized onions and au jus sauce are required, though! This year’s Super Bowl is right around the corner, and that got me thinking. What sporting events are on your bucket list? (If you’re not a sports fan, I understand. I’m a die-hard sports fan, but some years I’m still more excited about the Super Bowl appetizer table and the commercials than the teams actually playing in the game.) The Super Bowl is a good excuse to make tasty food and hang out with friends during what is typically a cold, dreary time of the year. And I’m all about friends and food! Sure, the Super Bowl gets a ton of media attention every year, but for me I put the Super Bowl as #5 on my bucket list of sporting events. I’m a college sports guy. I grew up in the South where nearly every car has a sticker, license plate or car flag supporting one of the local college teams. In fact, after moving to upstate New York, I was struck at the lack of interest in college sports. Up here, pro sports reign supreme. We’re equal distance from NYC and Boston, so we get plenty of Yankees-Red Sox and Giants-Patriots rivalry talk. But I’m still a college sports guy. For me, the College Football Championship Game comes in at #4. That is unless my LSU Tigers happen to be playing in the game…and then it jumps up to #1. #3 is the NCAA Baseball Tournament. College baseball wasn’t even on my radar until I moved to Baton Rouge, LA. I started going to LSU baseball games as something to do outside of football season. That’s when I realized I love college baseball. I’m not a fan of pro baseball (too boring! ), but college? Any day of the week! If you’ve never been to a college game, then put it on your radar for sure. Next up at #2 is the World Cup. I’m a huge soccer fan, and I religiously watch all of the World Cup games every 4 years. Lucky for me, Canada/US/Mexico will co-host the 2026 World Cup, and I’ve got plans to attend one of the games. Bonus points if one of the teams playing is the US, Italy, Belgium or the Netherlands. Honestly, though, I’d be happy regardless of the teams. And last but not least is the Final Four. I love college basketball, and I grew up in North Carolina…the hotbed of college basketball. I’ve been lucky enough to go to one Final Four back when I was in college. I’m a Duke fan, and we made it the championship game that year, but lost in the finals. I’d love to go back to the Final Four at some point! Ok, so that was a really long-winded way of saying that I love sports. I rarely actually go to games, partly because of where we live and partly because of the cost. But I do watch a lot of sports on tv. And we all know that watching sports goes hand-in-hand with tasty food, right? That’s where these French Dip Sliders come in! Hand-held sandwiches packed with flavor? And a dipping sauce, too? 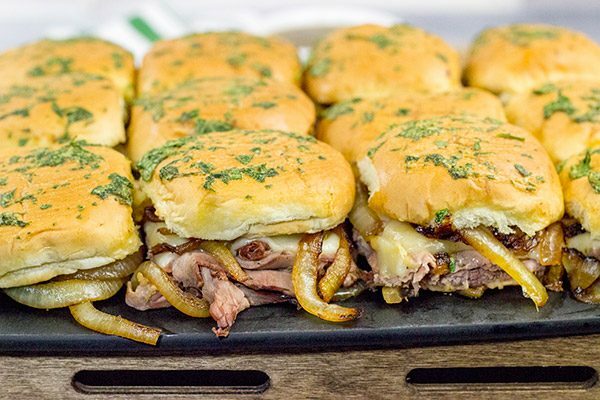 Sign me up for a batch of these French Dip Sliders! 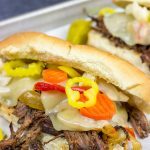 I posted our recipe for French Dip Sandwiches a couple of years ago. Those sandwiches are delicious! But a classic French Dip requires slow-cooking a beef roast. I wanted to make something a little easier for these sliders, so I opted for deli-sliced roast beef. (I used Certified Angus Beef ® brand roast beef.) The caramelized onions and au jus dipping sauce are both important elements of a good French Dip, so I knew those needed to be included here! For the caramelized onions, I just sliced a couple of yellow onions and let ’em cook down while I assembled the rest of these French Dip Sliders. Not too bad, and those onions were good enough to eat by themselves! 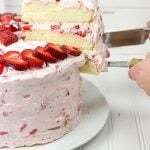 (I might’ve snacked on a slice or two.) And for the au just sauce, I created a shortcut version using beef stock and some seasonings. That sauce reduces down while the French Dip Sliders are baking. Once everything is done, you’re left with one epic snack for watching sports…be it the Super Bowl, the Final Four or the sporting event of your choice! Enjoy, friends! 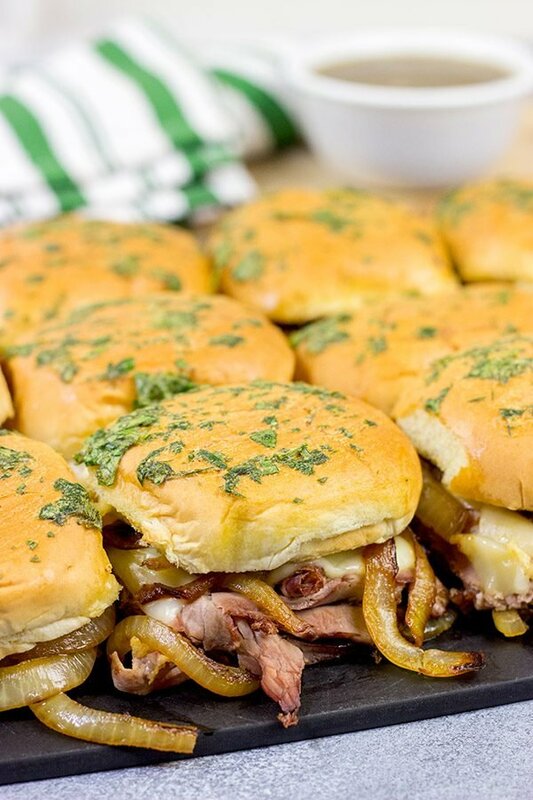 If you make these French Dip Sliders, swing back by and leave a comment. Or snap a photo and tag me on Instagram (@Spicedblog)! Using a large skillet, add butter and olive oil. Place over medium-high heat until butter melts. Add onions; cook, stirring occasionally, for 5-7 minutes, or until onions begin to soften. Spray a 9”x13” baking pan with nonstick spray. 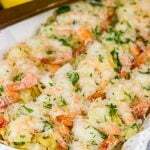 Without separating rolls, split the package in half horizontally and place bottom half in the prepared baking pan. Layer the the rolls with sliced roast beef, provolone cheese and caramelized onions. Place top half of the rolls on top. Using a sharp knife, cut sliders apart, but push sliders back together for baking. In a small bowl, whisk together melted butter and Dijon mustard; brush this mixture evenly on top of rolls. Sprinkle chopped parsley on top of rolls. Bake rolls for 10-12 minutes, or until cheese has full melted. Meanwhile, make the Au Jus by adding the butter to a small saucepan; place over medium heat until butter has melted. Add beef stock, Worcestershire sauce, salt and pepper; stir until well combined and let simmer for 15 minutes. 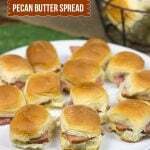 Serve sliders with Au Jus Dip on side. OMG college baseball is so much better than professional! I always thought I disliked baseball until the Ducks started up a baseball team a few years ago and now I’m obsessed. I’d love to go to the college World Series one day. I’d also love to go to the Olympic track and field trials at some point. 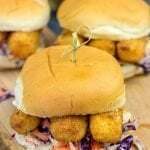 They’ve been held in Eugene (Oregon, my hometown) several times but I’ve never gone because of the crazy crowds. . .I really have no interest in going to the Super Bowl but I’m having friends over to watch and I think I’ll have to add these sliders to the menu. Have a great week, David! That’s quite a list of your sports priorities! I’m only it for the food. I’m really not that interested in the game, any game, but I’ll watch them! These sliders look perfect for grabbing and not missing a single play! Hah! I guess I do have my opinions when it comes to sports…and Laura would be quick to confirm that here on my end. Of course, whenever we’re talking sports, we need delicious sports food! I’ve gotta say that these sliders turned out so well…I love the onions piled on top. Yum! Thanks, Kathy! Hi David! It’s no noon yet but you have me craving these!! Luckily I’m going to the store today so I can pick up the roast beef and cheese to make these! I don’t need a sporting event to enjoy these! I totally know what you mean, Dorothy! I’ve been traveling today, and I was totally craving one of these sliders at about 8am in the airplane. Too bad that wasn’t on the coffee cart rolling down the aisle! These are really, really good. And it sounds like you’re back up and at ’em…awesome!! I hope you enjoy these sliders, my friend! As you know I’m not a game fan at all, but I’m absolutely flexible with all kind of events if any delicious food is involved (Meaning: I can pretend to be anyone if I subsequently get to enjoy food haha). And I can tell you: these sliders look fantastic! There’s an amazing deal, David: I will allow you to send me a batch of these bad guys, and in return, I WILL NOT be sending that box of lavender food I’ve been preparing for you 🙂 Deal? Then we’ll get along quite well, Ben. Just show up and pretend to like the same sports teams as me, and I’ll be happy to feed you all day long. 🙂 Also, what if I wanted that box of lavender!? I’m totally with you on the College Sports, David! I went to 2 of the Big Ten Schools and they were big time Football/Basketball teams, but now I live on the West Coast, where Basketball is the king of College Sports. March Madness is always fun! I love this recipe, because I love sliders. They’re a perfect opportunity to eat 2! Ha! And caramellized onions ->ALWAYS! 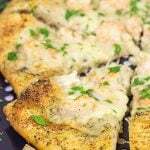 Thanks for the recipe – sounds perfect for all of the upcoming sports! Interesting! I’ve never lived out on the West Coast, so I didn’t know which college sports were popular out there. Growing up in the Carolinas, it was definitely all about basketball. Then when I lived down in Louisiana, it was all about football. I feel like I have the best of both worlds now! There are definitely a lot of good sporting events coming up, and these sliders are excellent sports food…I speak from experience! 🙂 Thanks so much, Laura! I loved watching College sports growing up, really liked college football. That said, when it comes to baseball our family is all for the RedSox. Great looking sliders, look delicious! So I gotta ask…how easy is it to keep up with the Red Sox over there in England? I know the NFL has been holding some games over there in London the past couple of years, but I’m not sure if baseball has been doing the same? (As I said, I don’t really follow pro baseball too much.) No matter the sport, though, these sliders are great eats! Thanks so much, my friend! I can’t think of a sporting event on my bucket list. (GASP!) My bucket list is full of travel. 🙂 I would eat these insanely delicious looking sliders at an event of any sort! I’m a huge French Dip fan! Hah! To be fair, my bucket list is loaded with travel spots, too…but there are also several big sporting events on there. Travel, food, sports. That pretty much sums it up for me! 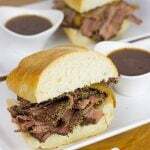 I love French Dip as well, and this short-cut version using roast beef was awesome. Thanks so much, Valentina! Well, it certainly looks like your going to have a chilly day for your Superbowl gathering and those sliders would be my first go to. Roast beef and provolone are a match made in heaven in my book. As far a sports bucket list, my #1 would be to attend the 2022 Winter Olympics in Bejing and have front and center seats for the hockey and curling championship. Be sure and take a photo of your Superbowl spread so we can imagine the joy of such a feast. We actually ended up having decent weather here yesterday, Ron. It was super cold last week, but we had a nice little break (above freezing!!) yesterday. I didn’t actually watch the Super Bowl this year as I am a huge New Orleans Saints fan. I joined other New Orleans fans in boycotting this year’s game…and it appears I didn’t miss much. The headlines here are calling it the ‘Snooze Bowl.’ Haha! Oh man, that would be so fun to go see hockey and curling at the Olympics! I wonder if the US men can repeat their curling gold?? I hope you had a great weekend, my friend! Wow! First of all, I’m so honored that you made this recipe, Dorothy. Second of all…your own rolls? Awesome! And it sounds like Gary really loved ’em, too. I do remember you saying before how you always munch in the middle of the night. I hope these sliders still tasted just as good at 3am as they did for dinner! 🙂 Thanks so much, my friend! Rating my favourite sports I’d have to put Rugby first (which I used to play at school until I did my back in) then tennis, then football. We’ve Rugby Union starting here on Friday which is 6 nations playing against each other (Scotland, England, Wales, Ireland, France and Italy) it’s very exciting. I try to get to the matches if I can but its difficult to get tickets. And expensive. No, I’d far rather sit in the warmth of my own house now watching a match and nibbling on stuff of which your french dip sliders are definitely a contender. Yum! You know, I’ve always enjoyed watching rugby. I don’t entirely understand the rules, but it’s still a fun sport to watch. Sort of a cross between US football and soccer. I hope you had an awesome weekend watching the Rugby Union!I just googled it, and it appears that Scotland got off to a good start…here’s to continuing that run! Also, I totally hear ya about the cost of sporting events. 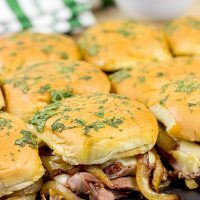 It’s fun to go every once in a while, but I’d much rather stay home and eat delicious snacks like these French Dip Sliders! A big college football fan here! In Massillon, Ohio, where I was born, the hospital gave every baby boy born there a little football. The Buckeyes start ’em young! I can’t think of anything I’d rather eat during a game than these fantastic sliders (or any of your other mouth watering game day food!). Roast beef from the deli makes them so easy! Hah! I saw something on the news this past year (or was it 2 years ago?) about a hospital in Ohio where volunteers would knit little OSU hats for the newborns. I’m not an Ohio State fan, but I gotta say that’s pretty awesome! I love the passion that comes with college sports. 🙂 Thanks so much for the kind words (and Instagram love, too), Kelly! You rock! 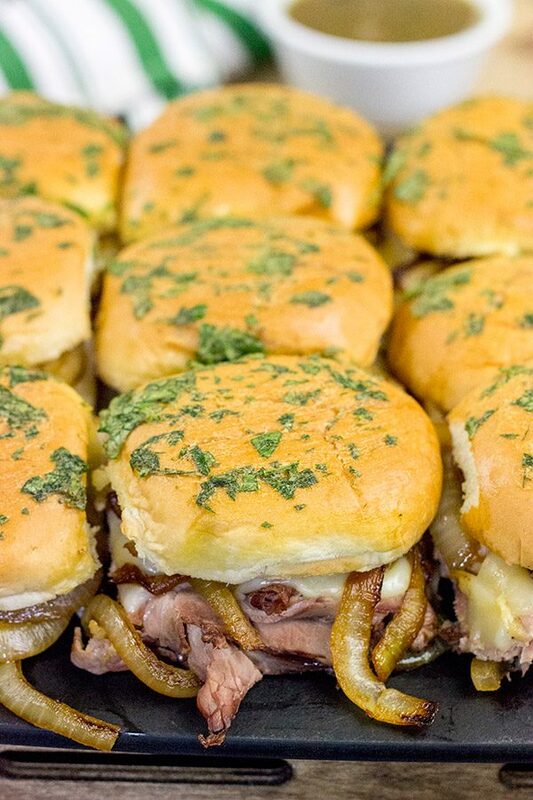 I love these French Dip sliders for Super Bowl, but, honestly I think I would prefer them year round. Sometimes I feel like the bread overwhelms the meat in typical French Dip sandwiches, but in yours the ratio is just perfect! Hey, I totally agree with you there, Marissa! Who says the Super Bowl gets to have all the fun!? These sliders would indeed be tasty year-round. Watching a movie with friends? Sliders! Board game night? Sliders! These really are pretty easy to make thanks to starting with the tasty roast beef…and they’re great for a crowd, too. Thanks so much, my friend! Hey Jenny! There is a bit of mustard in the recipe for the sliders, but I don’t think the finished version is very mustardy at all. Of course, if you’re concerned, you can just leave the mustard out. Just don’t skip on the caramelized onions and au jus dip…those are a requirement! 🙂 I hope you enjoy these sliders…they are a favorite around here! So, I’m not a huge football fan …or even sports fan…. but I do enjoy the World Cup – too cool that US is one of the hosts – I saw that Atlanta might be one of the cities – in which case, dude, you gotta come down and visit with Laura and Robbie – and if y’all come to Athens, we have an extra room for y’all to stay in! My only request is to share half of one of these delicious sliders and a radio bar and a bucket of bourbon pecan frosting – deal? Oh, I’m sure Atlanta will end up being one of the host cities. I mean it’s the largest city in that whole corner of the country! And be careful, I might just have to take you up on that offer to visit. Of course, that’s still 7 years away. That just means we have plenty of time to plan out a delicious menu for that trip! 🙂 And yes, I will be happy to bring radio bars and bourbon pecan frosting with me! wao! it looks so delicious and healthy too! do you add any sauce like mixture of ketchup and mayonnaise?